Florida Farm Bureau advocates on behalf of farm families on the local, state and national levels. We represent farmers and the rural communities. By advocating for the programs and policies that help farmers and ranchers prosper, we help to protect domestic food production and Florida’s natural resources. Farmers and ranchers help to generate an annual statewide economic impact of $127 billion. They maintain greenspace, conserve water and preserve wildlife habitat. Our members are instrumental in helping us work together to accomplish our legislative goals that benefit all Floridians. To make a difference in your community, get involved by contacting your local county Farm Bureau. Our State Legislative Affairs team is based in Tallahassee and serves as the link between our members and government officials at the state level. They work with the state Legislature, Governor’s office and other departments and agencies to promote Farm Bureau policy as set by our grassroots members. Please contact our State Legislative Affairs team for more information at 850.222.2557. Agricultural Sales Tax Exemptions: We helped save farmers and ranchers more than $2.3 million in tax exemptions for prescription and non-prescription animal health products used for poultry and livestock. Exemptions include, but not limited to antiseptics, cotton and gauze for bandages, lotions, vaccines, vitamins, worm remedies and aquaculture health products. View tax exemption certificates and tax information publications (TIP). Elimination of Supplemental Pesticide Fee: We helped secure an annual $2 million reduction on pesticide fees. Pollution Notification: We helped clarify reporting procedures for pollution events. All events must be reported to the Florida Department of Environmental Protection who must notify the public within 24 hours after a pollution event has occurred. Everglades Restoration: We protected farmland within the Everglades Agricultural Area and reduced the total cost to build the water storage reservoir south of Lake Okeechobee from $4 billion to $800 million. Covered Farm Vehicle Certificate Available: We helped pass legislation that streamlined registration of covered farm vehicles to transport product from farm to market. Farmers and ranchers are eligible for statewide CDL exemption to transport produce throughout Florida and 150 miles from their farm into a neighboring state. View general presentation on Covered Farm Vehicles. Long-Term Water Policy Plan: We helped pass SB 552, a comprehensive and long-term water policy plan to protect, preserve and restore Florida’s natural resources, while providing adequate water to meet the needs of agricultural producers, municipalities and consumers. This legislation is the first of its kind for Florida and is responsible for several improvements to state laws impacting state springs and water quality. Read more. Sales Tax Exemptions for Farm Equipment: We helped save Florida farmers and ranchers an estimated $13 million in state and local taxes each year. The substantial tax break savings includes elimination of sales tax on parts and repairs for farm equipment, irrigation equipment and farm trailers. Greenbelt Protection: We helped prevent local governments from removing the agricultural assessment on land being used for bona fide agricultural purposes. Duplication of Regulations: We helped amend the Ag Lands and Practices Act to prevent local governments from assessing duplicate regulations and fees on farms regulated at the state or federal level. Water Policy: We helped prevent the Environmental Protection Agency from overstepping its regulatory duties by passing legislation that protected our objective of a state-run nutrient program to keep Florida’s waterways clean. Agricultural Certification: We helped pass a bill that recognizes the critical need for agricultural careers in the state and provides a path for the approval of more agricultural certifications for students. 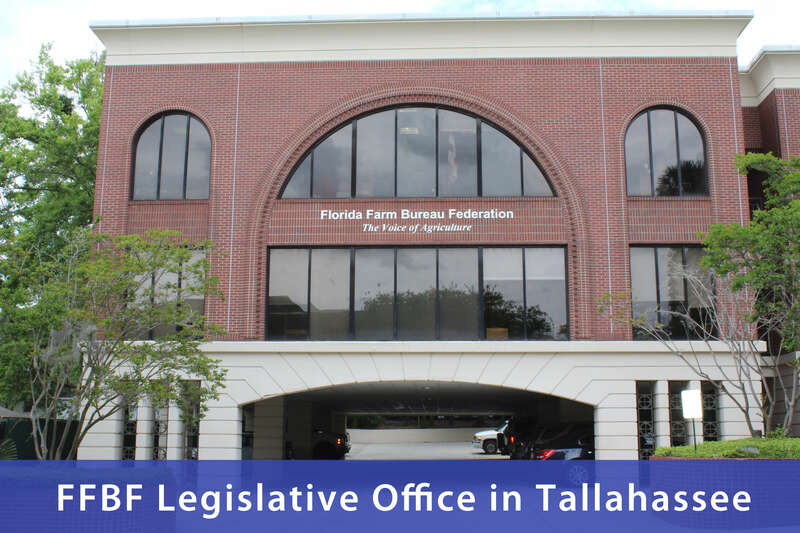 Each year, Farm Bureau members visit Tallahassee to meet with state lawmakers to discuss public policy issues that affect agriculture. During this trip, a Taste of Agriculture reception is held to celebrate the family farmers and the importance of agriculture to our state. Join us in 2020! From hurricane relief to tax policy and protection of water quality, we ensure the needs of the farming and rural communities are priorities. Learn More. During legislative session, Florida Farm Bureau provides timely updates on pertinent agricultural issues in AgWatch, a weekly policy issues publication. Florida Farm Bureau recognizes key lawmakers for their active role in supporting agricultural policy during each legislative session. Our FBACT program provides you with legislative, regulatory and policy updates electronically. When messages to our Congressional delegation or state legislators are needed, we’ll email you an Action Alert. The alert will include talking points and will automatically send your message to the correct person. Participate and sign up here.